Listen to "100 humorous quotes" on your iOS and Android device. Intelligence and cleverness are never boring. 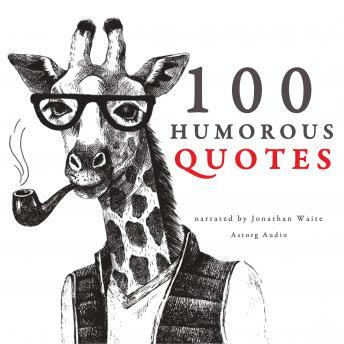 We have selected for you 100 quotes from the wittiest authors ever, from Oscar Wilde to Jerry Seinfeld, with the help of Woody Allen, Mark Twain, Winston Churchill, Groucho Marx and many others. Enjoy these pearls of humor to brighten your day with a good laugh, discover invaluable remarks and jokes to surprize your friends and enemies with, and shake hands with the greatest minds. Those 100 quotes are among the funniest and the deepest alike, from clever remarks to unbelievably elegant puns; let them inspire you, and may you come up with many more.